I don't like to throw stuff away, especially if I think I can do something with the item. In this case, it was six candles that had burned all the way down. I HATE throwing away candles if the wax isn't completely used because I feel like I could get a lot more scent out of them. So I decided to finally do something about all those "useless" candles that were taking up space in my hutch. I've seen tutorials on cleaning out candle jars, and they just scrape out all the wax and throw it away. 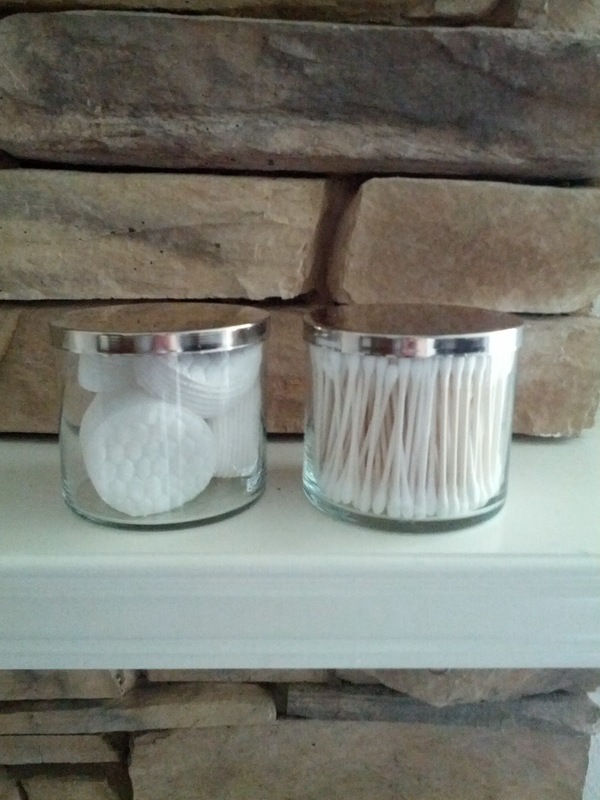 Here's a tutorial that will upcycle your wax and repurpose the jars! This is really a two-in-one project, because you're getting a new candle out of it, and you're getting some new apothecary jars! Place a candle in the pot of water and heat. Do not let the water on the stove boil, or you can crack your glass. Take the two pens or pencils and secure them together with a rubber band on one end. Think of it as training chopsticks. 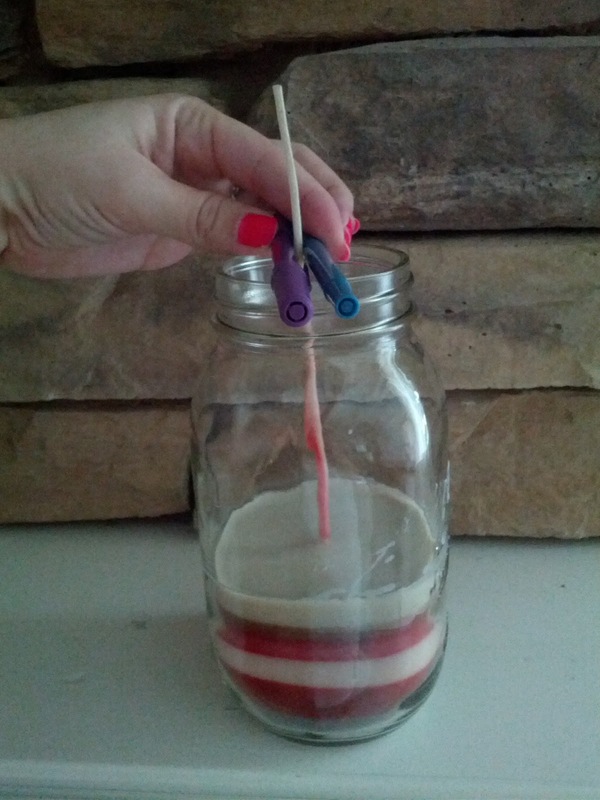 This will help hold the wick in place so it stays centered in your candle. Once the wax is melted, use the oven mitts to remove the jar from the water (glass and wax can be very hot) and pour into the new jar. Place your wick into the jar, and use the pens to hold it centered. I stuck my jar in the fridge so the wax would harden faster. Place your next candle in the water to melt the wax. While it's melting, you can clean out the jar you just emptied. Again, be careful! The glass may be hot! If it's too hot to handle with your bare hands, wait a few minutes. I found it easiest to clean the jars out before they cooled all the way, just because the remaining wax residue was still soft and easily wiped out. Use the butter knife to scrape out any large chunks of wax and the little wick butts at the bottom. Use the paper towels to wipe all the wax out. You'll go through a lot of paper towels. Once you have most or all of the wax out, spritz some Pledge, Goo Gone, or baby oil into the jar. Because oil is nonpolar, it really helps lift out a non-oil substance like wax. They repel each other, and the oil will get under the wax making it easier to get out. The pledge also helps buff and shine the glass. Rinse the jars with soap and water, and towel dry. You may want to give the lids a little shine up with the oil, too. By now, your next candle should be melted, and you can repeat the process! Pour the melted wax into the new candle, and repeat until you have a new, layered candle. You may need to re-center the wick each time, because the hot wax will cause it to move. Just use those pencil chopsticks! Do not pour hot wax into the new candle until the layer before it has totally hardened, otherwise your scents will mix (unless you want that). All six of my candles' remaining wax filled a mason jar almost halfway. You could just trim the wick and be done, but I'd like to add more wax to it later and make a bigger candle. And there you go! You just knocked out two projects in one! A new candle and new apothecary jars! You could fill them with goodies and give as gifts, or do what I did and fill them with cotton and q-tips for the bathroom! You make this look pretty easy! I am like you and hate throwing things away! Ill have to try this out!